For 27 years, photojournalist Bill Hess has lived in Wasilla, Alaska, which few Americans had heard of until its former mayor became the Republican nominee for vice president of the United States. Bill has been posting his photographs on blogs for some time, but with Wasilla much in the news he has broadened his agenda. His new blog is called Wasilla by 300, meaning its scope is a 300-mile radius of the town, "perhaps the most wild, dramatic, gorgeous, beautiful section of land and sea to be found in any comparable space anywhere on Earth." It includes Wasilla's sister city of Palmer, where Hess took the Alaska State Fair photo at left. 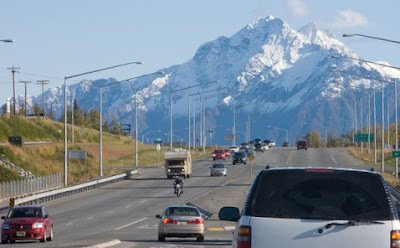 "Wasilla is not the quintessential small American city that it has recently been built up to be since former Mayor Sarah Palin was chosen by John McCain to be his running mate. Yet -- Wasilla is my home and if I am lucky it will be until I grow old and die," Hess writes. "Wasilla is a sprawling community that has been slapped down hodge-podge upon what was so recently wilderness of the most exquisite beauty. In its design, it is deliberately anti-zoned, anti-planned. In the building of Wasilla, the desire to make a buck has trumped aesthetics and all other considerations. This town, built in the midst of exquisite beauty, has largely become an unsightly, unattractive, mess of urban sprawl." Many of Hess's Wasilla photographs are "grab shots," taken as he drives around the area, like the one above. "Despite the odd, random, nature of the images, I believe they communicate something powerful about this town that I have never seen expressed anywhere else," he writes. "if one were to search hard enough, it might just be possible to find a sense of community here, and a town soul. So, using my skills as a photojournalist and a writer, I hope to do just that. If this place has a sense of community, I will find it. If there is a town soul to Wasilla, I will document it." Hess also has a site that displays his professional work, here. The emergency legislation to ease the credit crisis includes "several billion dollars in education and road funding for some of the nation's most remote communities, through programs aimed at helping areas with large swaths of untaxed federal land," reports Bettina Boxall of the Los Angeles Times. The biggest item was a four-year extension of the eight-year-old program to compensate counties with national-forest land for decreases in logging. The bailout bill also contained a four-year extension for the payment-in-lieu-of-taxes program, in which the federal government compensates local governments for taking land off the tax rolls, and a one-year extension, to 2010, of the $9 million annual appropriation to the Abandoned Mine Reclamation Fund. For a PDF copy of the 451-page bill, from the Senate Banking Committee's Web site, click here. "Soaring energy prices threaten to slow the booming farm economy," writes Jason Henderson, vice president and Omaha branch executive of the Federal Reserve Bank of Kansas City, in the latest edition of the bank's electronic newsletter, The Main Street Ecomomist. And since he wrote that, the credit crisis has surfaced, compounding concerns about energy costs. Largely due to energy prices, mainly natural gas used to make fertilizer, input costs for American farmers in July were 20 percent higher than a year before. "Fuel prices also nearly doubled. Seed prices rose 30 percent. And chemical prices went up 12 percent," Henderson notes. That could make farmers ask for larger operating loans to plant next year's crops, at a time when the credit crunch may make agricultural lenders more stingy. When John McCain's campaign pulled out of Michigan yesterday, leaving it to Barack Obama, it allocated its resources elsewhere, including one of the most rural states and one of the most rural congressional districts in the nation: Maine and its Second District. Votes in the Electoral College are determined by a state's number of congressional districts plus two (each state's number of senators). Maine and Nebraska, which have two and three districts respectively, award a vote for winning a district and two for winning a state. We like that system; it would make candidates campaign in states they would otherwise ignore. But why would McCain go after a single vote? Some models show it could win the race for him. Sasha Issenberg of the Boston Globe reports from Bangor: "While both campaigns have long expected that Obama would carry the state, both public and private polls show the race closing. . . . Much of McCain's gain appears to derive from a renewed appeal in Maine's Second, the largest district east of the Mississippi River, sprawling through the state's rural north and east. Maine consultants describe the differences between the electorates in their two districts in lifestyle terms: The southern, liberal First is hiking and kayaking, the Second is hunting and fishing." UPDATE, Oct. 5: Palin will be in Omaha tonight, "another sign that Nebraska's 2nd Congressional District is in play," reports Maggie O'Brien of the Omaha World-Herald. "It's rare for a member of the national ticket in either party to visit traditionally Republican Nebraska this late in a presidential campaign." (Read more) Oct. 6: Peter Slevin of The Washington Post checks out the district. The Republican Party has become a small-town party, to its detriment, conservative columnist David Brooks, right, said tonight on PBS NewsHour. "I think Sarah Palin did very fine last night by her own standards, but this has become -- the Republican Party has become a small-town party, running against -- as Sarah Palin did last night -- against big cities, against the East Coast, to some extent, against newspaper readers," Brooks said. Yes, newspaper readers. "I understand why they're doing it, running against Washington. This is the way Republicans do populism," he said. "But in the long run, it's poisonous and self-destructive. You cannot be a majority party in this country if the coasts don't like you and people who read newspapers don't like you. And they have narrowed themselves. And I thought McCain was going to be a chance to reach out beyond the traditional red, rural America. And he's not taking that up. And with Sarah Palin, short-term gain last night, but long-term turning people off." Brooks also said John McCain's campaign wanted to run a non-traditional campaign that reached out to the poor in rural areas, but abandoned that when it failed to get media coverage. "Their model of the campaign was the poverty tour McCain took early in the race, where he went through the southeast, mostly, in Appalachia and other places, and ran as a new kind of Republican. And as they would say is, 'We got zero stories on the network news out of that. We learned early on, if we don't attack Obama, we do not get on the news. And, therefore, we had to attack Obama. We had to run this kind of campaign.' That's -- that would be essentially be their argument." For a transcript of Brooks and liberal commentator Mark Shields' conversation with host Jim Lehrer, click here. The latest reportorial take on Barack Obama's prospects in the potentially pivotal state of Virginia, which may pivot on the votes of whites in the rural southwest corner of the state, comes from one of the best, Peter J. Boyer of The New Yorker. His 4,600-word story is titled "The Appalachian Problem," so it's also about West Virginia, Pennsylvania and Ohio, which collectively could decide the presidency. As Boyer perceptively notes, Southwest Virginia has "small hill towns that are nearer, in mileage and in spirit, to the old factory town of Ironton, Ohio, than to the glass office towers of northern Virginia." Obama's speech won "cascading cheers," Boyer reports. "But it was for a largely partisan crowd, which had come to the event already convinced, and it was hard to guess how it would play outside that gym." To help him figure that out, he paid the obligatory visits to David "Mudcat" Saunders, "who has made a profession of selling Democrats to rural Virginians," and U.S. Sen. Jim Webb (in illustration by John Cuneo), who has written a book and many articles about his Scots-Irish heritage, which largely defines the region. The story is as much about these two Democrats as Obama; they say his prospects there are less about race than most observers think, and more about culture. Meanwhile, Bluegrass music legend Ralph Stanley, long an active Democrat, is on the air with a radio ad for the Obama campaign, aimed at his home Southwest Virginia, The Associated Press reports. In a touch of irony (intended? ), as Stanley speaks, a recording of his and his brother Carter's classic "Rank Stranger" plays in the background. The Alaska governor "brought out what appeared to be a strategy from her 2006 gubernatorial campaign by telling stories from her own life in Wasilla and relating them to the struggles of other Americans," Michael Rovito writes for the Frontiersman, a thrice-weekly. "At one point, Palin responded in part to a question by moderator Gwen Ifill of PBS by saying she may not answer questions put to her the way Ifill or Biden wanted to hear them, but she would talk to the American people. The response drew raucous applause from the crowd at Tailgaters, which also laughed every time Biden had a speech stumble as he spoke." "Down the road at Hacienda, a decidedly different atmosphere was felt. Debate viewers there snickered as Palin answered questions, and cheered just as loud as those at Tailgaters — only for Biden. Jay Cross, a Big Lake resident, said although he supports Obama, he thought Palin held up to the pressure. 'They made expectations so low,' Cross said. 'I think she’s surviving.' 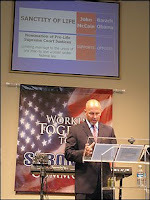 However, Cross also said Palin’s answers lacked substance. 'There’s a lot of babble speak here as opposed to answers,' Cross said." Rovito also writes, "Many Mat-Su Valley locals have complained recently that the campaign has shielded Palin and coached her to act differently than Alaskans know her to be. Many have blamed the McCain camp for blunders during Palin’s interviews." For Rovito's story from the valley of the Matanuska and Susitna rivers, and comments from readers in other states, click here. Some small towns in Connecticut are shutting down their Web sites after the state legislature passed a law requiring them to post meeting agendas and minutes. "Others are trying to work with rules they consider vague," reports Michael Gannon of the Norwich Bulletin. The law, which took effect Wednesday, "requires municipalities to post agendas for boards and commissions online 24 hours before a scheduled meeting," reports the First Amendment Center. The law applies to boards, commissions and committees, and town clerks say they can't handle the new task. For example, in Woodbridge there are 73 boards, commissions and committees, the center notes. The credit crisis has seen banks around the country tighten lending practices, but this has not been the case for "rural banks in U.S. farm country," reports Carey Gillam of Reuters, who writes that such banks "are not freezing credit to customers like large money center banks, offering a bright spot in an otherwise gloomy economy." Rural communities that rely on agriculture have not felt the pinch from the failure of some of Wall Street's biggest banks. "Despite a cascading that has locked up loans for businesses and consumers around the country, small community banks in rural areas generally continue to hold interest rates steady, lines of credit open and are offering new loans," Gilliam reports. "Stocks of agricultural companies took a dive along with grain prices Thursday amid worries that the credit crisis would slow global demand for farm goods and pinch farmers who have been voracious buyers of farm supplies," Lauren Etter reports in The Wall Street Journal. Near-term corn futures fell to $4.54 a bushel, fertilizer maker Mosaic fell 41 percent, and "Other agriculture companies also suffered as commodity prices continued to decline." Union miners walk out to protest NRA filming anti-Obama TV commercial at mine in northern W.Va.
A film crew for the National Rifle Association showed up at a Consol Energy mine in Monongalia County, W.Va., this week and, according to the United Mine Workers, asked several miners, “How do you feel about having your Second Amendment rights taken away if Obama becomes president?” Word sped to UMW President Cecil Roberts, who declared a memorial day, allowing the 440 UMW members at the Blacksville No. 2 mine to walk off the job in protest. The UMW has endorsed Obama, but “Union members are the backbone of the NRA’s membership,” NRA spokesman Andrew Arulanandam told Steven Greenhouse of The New York Times. A Consol official said the company had allowed an NRA crew to film at the site "several years ago without any problems," Greenhouse writes. "Consol asked the NRA not to use any of the interviews done at Blacksville in any future ads, and he said the NRA had agreed. He said the union went ahead with its work stoppage even though it had been informed that the interviews would not be used." UMW spokesman Phil Smith replied, “We were upset that the company allowed the N.R.A. to come on its property and try to use our members for political purposes knowing we had already endorsed Obama and a lot of our members had already endorsed Obama.” (Read more) For an earlier story from Courtney Dunn of WBOY-TV in Clarksburg, click here. Most weekly newspapers seem to be taking little note of the presidential election, but we think editors who ignore it are failing to serve their readers -- and missing a bet by not covering or commenting on something of great interest. Across the nation, states are reporting record voter turnout, and polls show record interest in the election. Weekly editors should also remember that many if not most of their readers don't read daily newspapers, so their primary source of information about the election is television, which is largely sound bites and superficial summaries on the news and misleading ads all day long. While most weeklies can't offer their own shoe-leather reporting on the election, they can borrow material from The Rural Blog (with proper credit) and their Web sites can provide links to groups like FactCheck.org and PolitiFact.com, which separate truth from fiction in political ads. They can also offer commentary that resonates with their local readers. One example is this week's "From the porch" column by Brad Martin of the Hickman County Times in Centerville, Tenn., which is headlined "Astonishing times" and begins by mentioning weekly papers' traditional role and then saying this is a time to go beyond it: "Even a local gopher like me has had to pull up and pay attention to what’s been going on at the national level for the last few weeks." Martin asks and answers, "How do we get to election day from here? Cage the attack dogs, please, and try to listen. Best chance for that is during the debates. What I will be looking for are assurances that we have a candidate that will talk to others and listen . . . "
Meanwhile, Martin gives his local take on the big issue of the day: "The financial wizards are in trouble, and markets are teetering. Lenders are overextended in the quest for loans and more profit. Heck, even here in Centerville, I continue to see signs advertising real estate with absolutely no down payment. That’s simply reckless. If folks can’t down-pay, they’re not ready to buy." The Times is not online, but you can download a PDF of its current editorial page here. That's from http://www.ruraljournalism.org/, the site of the Institute for Rural Journalism and Community Issues. And if you see other good examples of presidential coverage or commentary in weekly newspapers, add a comment to this item or e-mail Al.Cross@uky.edu. Rural areas are being hit hard as the airline industry suffers a financial crunch and reduces its capacity, as shown in the chart from OAG Analytical Services, which monitors airline schedules. OAG, part of Official Airline Guide, reports that 36 airports that had commercial flights last year will not have them this fall. Decreasing sales and the credit crunch are dealing the death blow to many car dealerships, which can be economic and civic linchpins in rural areas. California Gov. Arnold Schwarzenegger has signed a new law blocking retaliation against journalism teachers who protect student journalists from censorship. The law "provides that no public school or college employee may be dismissed, suspended, disciplined, reassigned, transferred, or otherwise retaliated against solely for acting to protect a student who is engaged in legally protected conduct," reports the Student Press Law Center. "This includes the publication of speech that is not obscene, libelous, slanderous or substantially disruptive to the safe operations of the school." Senate Bill 1370 also provides students with the right to sue schools for censorship after graduation. The U.S. economy is enormously complicated. Screwing it up takes a great deal of cooperation. Claiming that a single piece of legislation was responsible for (or could have averted) is just political grandstanding. Biomass facilities to produce renewable energy are facing challenges from some timber interests. In Georgia, three planned facilities have met with opposition because the woody material used to create energy is also used by timber industries. There is also concern from paper producers that the new plants could drive up prices of wood products. “They’re going to see these guys as competition — and they may very well be,” Alva Hopkins, a spokesman for the Georgia Forestry Association, told Kate Galbraith of The New York Times. There is also fear that the new biomass facilities would require live trees for energy production. That fear appears to be well founded. Mike Price, the chief operating officer of the proposed biomass facility at Oglethorpe, Ga., said, "For a plant this size we will have to harvest some trees." Rising prices for metals have created new interest in mining in many Western communities where mines had been abandoned. Many communities are torn over the development. While mining promises new jobs and money, their economies have moved away from mining, and some fear that the return of the industry will disrupt those new economies and damage the environment. "Since 2004, the number of claims filed on federal land has more than doubled," writes Nicholas Riccardi of the Los Angeles Times. "During that time, gold prices have risen from $400 to nearly $900 an ounce." Other minerals have climbed even faster -- copper and molybdenum, an alloy often mined in the Rocky Mountain region, have soared 600 percent in the last four years. Although no agency tracks mine activity nationwide, experts say the uptick has been remarkable." Many former mining communities have turned to tourism to buoy local economies. In these communities the return of mining companies could threaten the tourist industry. The environmental impact of the mining also raises concern for many of these communities. "Environmental groups and towns in northern Arizona stopped one company from digging for uranium near the Grand Canyon," adds Riccardi. "In the mining town turned tourist mecca of Crested Butte, Colo., residents fly Tibetan prayer flags to protest a company's plan to mine a mountain basin that looms over downtown." Jim Denk knows the work involved in running a small-town newspaper. Although he and his wife, Janet, employ just a few part-time workers at The Matthews Record, the local newspaper they bought a few years ago, they still end up doing everything from writing to selling advertising to delivering the papers to the post office in the North Carolina town of 28,000 near Charlotte. Those responsibilities alone are enough to keep the couple very busy, which makes the stunning visuals created by Denk all the more impressive. He is creating a lot of buzz in the journalism community for the detailed graphics he creates for the weekly. In an interview, Denk told Sara Quinn of the Poynter Institute about his work. For example, he found that wildlife issues were important in his community. So, he says, "I created an illustration of a forest, the way it looks in North Carolina. I put everything in it that I've ever seen there. Like salamanders to frogs. I did the research on the frogs, what kind they were. 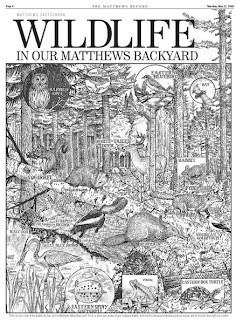 Turtles to deer to barred owls. That was fun." His illustration appears above. Rural banks are making their own contribution to easing the credit crisis, with a plan that has received widespread support from both Democrats and Republicans, both presidential candidates and the Bush administration, reports The New York Times. The Independent Community Bankers of America have lobbied for an increase in the amount of deposits insured by the Federal Deposit Insurance Corporation. The banking association asked that limits on insured deposits be raised from $100,000 to $250,000. The move is aimed at increasing consumer confidence in the banking system and providing an additional safety net for small businesses, writes David Stout. The credit crisis is hitting home in rural America, Senate Republican Leader Mitch McConnell said today, citing rural examples from his home state of Kentucky in his second floor speech of the day on the subject. He told reporters that Congress would act this week. "I'm hearing from towns and municipalities throughout Kentucky that can't find the money to finance new schools and other civic projects, and from farmers and small business owners who are suddenly being told by their banks that a long-term loan is due," McConnell said on the floor. "Others are being pressured to pay more, or well ahead of schedule. And these are people with good credit." Monday's record plunge in the stock market struck fear into retirees, McConnell said. "I'm hearing from people like the retired school counselor in Anderson County who said she can't afford to see her small retirement savings vanish. 'I've never written to any senator or congressman before now,' she wrote." McConnell quoted an unnamed Central Kentucky woman who said she is afraid she will have to sell part of her family's farmland if the rescue plan fails. Friday's first presidential debate showed many differences between Sens. John McCain and Barack Obama, but they agree on at least one thing: They want to put an end to mountaintop-removal mining of coal, reports Ken Ward Jr. of The Charleston Gazette. While campaigning in Florida, McCain was asked whether he supported "eliminating mountaintop removal mining and the practices like that." The Republican responded, "You know, I do." He went on to say that coal companies are working to become more environmentally sound, and that he supports other types of coal mining, Ward reports. Obama told an environmental group last winter that other forms of mining need to be found, and told supporters, "We're tearing up the Appalachian Mountains because of our dependence on fossil fuel." (Mountaintop removal occurs in West Virginia, Kentucky, Tennessee and Virginia.) But this month, his campaign confirmed to Ward that he supports ending mountaintop removal. What Ward finds so interesting about the candidates' position on this issue is not that they agree, but that they haven't caught much flak for their stances. Asked about them, West Virginia Gov. Joe Manchin said only that the state regulates mining responsibly. Phil Smith, a spokesman from the United Mine Workers, said that where coal is mined is not their concern: "We just mine it." The "toughest reaction," Ward reports, came from the National Mining Association. Carol Ralston, the association's spokeswoman, said the candidates need to reconcile their position on mountaintop removal mining with their support for using coal as an energy resources and "clean coal" research. In the past, opposition to mountaintop removal has been considered a tricky political issue. Al Gore's reputation as "anti-coal" may have cost him West Virginia's electoral votes and the presidency in 2000. One Democratic pollster told Ward that, in today's political climate, the candidates' positions make sense. "Political opinion has just caught up with public opinion," Lakje said. Ward notes a Lake poll showing that West Virginia has three times as many people who "strongly oppose" mountaintop removal as there are those who "strongly favor" it. To read more, click here and here. Many rural commuters are finding the drive to work increasingly difficult due to continuing gas shortages in the heart of the Southeast. The lingering effects of hurricanes Gustav and Ike have created long lines, high prices and shortening tempers at gas stations in Georgia, North Carolina and Tennessee. The rising cost of energy in rural Alaska is causing residents to move to urban communities. State government tried to alleviate some of the pressure by giving them a $1,200 check from the Permanent Fund, the state's oil and gas trust fund for natives, but many are using that money to move. "The main evidence of the migration is enrollment in Anchorage schools, which have seen more than 400 new Native students since school started," report Julia O'Malley and Kyle Hopkins of the Anchorage Daily News. "Middle income people in rural Alaska, who make up about 60 percent, are currently spending 12 percent of their money on energy, compared to that group in Anchorage, who are spending just over 3 percent." Felix Frankfurter, a great Supreme Court justice of the mid-20th Century, liked to say that "In a democracy, the highest office is the office of citizen." Today, technology has created the term "citizen journalist," bringing back the full promise of the First Amendment, allowing every American to exercise journalistic rights like the pamphleteers of old. Sometimes people become citizen journalists without intending to. That includes Anne Kilkenny of Wasilla, Alaska, "the woman behind the infamous e-mail that aired criticisms of Sarah Palin to millions across the cyber-globe," as she is described by Erika Hayasaki ofthe Los Angeles Times. Kilkenny's story of doggedly attending Wasilla City Council meetings has been told many times, but Hayasaki's story reveals more of a journalistic role: "Nick Carney, who served on the council then, remembers there were times when no one showed up to watch, 'not even the guy from the newspaper.' Sometimes Kilkenny was the only one." Hayasaki writes, "Judy Patrick, who served as deputy mayor for four years, is upset that the Internet and media have turned Kilkenny into a Palin expert. 'Anne Kilkenny, the nut case?' Patrick said. 'I mean she came to every single one of our council meetings but was she ever elected? No.' To others, Kilkenny 'is like the watchdog of the council,' Carney said. 'She came to the meetings and made sure we were dotting our I's and crossing our Ts.' 'Anne looked at things logically,' said Darlene Langill, a former City Council member." Surveying the political and financial landscape after yesterday's failure of the financial-system bailout, it's clear most Americans didn't trust or understand what they were being told by Washington, Wall Street and journalists. Steven Pearlstein of The Washington Post sees it much like we do: "In better times, the public might have put aside its reluctance in response to the strong and unified recommendation of political and business leaders. But it is a measure of how little trust remains in both Washington and Wall Street that voters are willing to risk a serious hit to their wealth and income rather than follow their lead." As is often the case, conservative columnist David Brooks of The New York Times nails it, saying the "no" voters "did the momentarily popular thing, and if the country slides into a deep recession, they will have the time and leisure to watch public opinion shift against them." He especially targets House Republicans: "They have once again confused talk radio with reality. . . . They will be held accountable. The short-term blows will fall on John McCain, the long-term stress on the existence of the GOP as we know it." Reflecting some comments of those who voted against the plan, William Greider of The Nation, a liberal magazine, says it would give too much power to Treasury Secretary Henry Paulson and his successor. The vote "adds another deep shock to the system, both in politics and economics, but what an invigorating moment for democracy," Greider writes. "The financial bloodbath will continue, but unless the deal on the table changes significantly, Henry Paulson gets to decide who lives and who dies." The Senate has passed a different version of House-passed legislation to overturn the new Farm Bill rule that keeps farms of less than 10 acres from receiving most forms of commodity payments. At issue is the Department of Agriculture's ruling that farmers cannot aggregate such farms to meet the 10-acre threshold. The amendment now goes to the House. For our posting on the previous House vote, wiht a listing of the states that would be most affected, click here. The Access Project has released a survey outlining the pressing health issues facing rural communities, putting particular emphasis on high insurance costs that continue to cripple family finances. Begun as a collaboration between the Kansas Farmers Union, the University of North Dakota Center for Rural Health and Brandeis University, The Access Project (TAP) serves as a local resource for local communities seeking to improve health and influence health policy. In 2007, TAP was responsible for the Health Insurance Survey of Farm and Ranch Operators, which collected data from non-corporate farms and ranches in seven states: Iowa, Minnesota, Missouri, Montana, Nebraska, North Dakota and South Dakota. The survey found that some families 40 percent of their income on health care and insurance. "Surprisingly, those who earned less than $20,000 were less likely to report financial hardship than those with incomes between $40,000 and $99,999," the report says. Of the 2,017 respondents, 90 percent said all members of their households had been continuously insured in the previous year and still faced financial hardships while trying to cover health expenses, negating the common claim that only the uninsured face extreme medical debt. New studies suggest switchgrass may become a valuable source of renewable energy in the U.S. From the Great Plains to the Southeast, much research is determining just how effectively switchgrass grows and can be converted to energy. Early results suggest that switchgrass may prove more attractive than corn. "Switchgrass has been touted as the next miracle crop of the renewable fuel industry," writes Greg D. Reber of the Telegraph Herald of Dubuque, Iowa. "It's a fast-growing variety of prairie grass that once grew wild across the United States. Ray Smith, a forage specialist with the University of Kentucky, is conducting research in Eastern Kentucky to show local farmers the advantages of switchgrass. 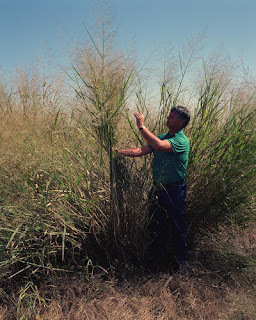 John Flavell of the Daily Independent in Ashland writes, "Stopping short of calling switchgrass a 'super plant,' Smith said the plant comes as a complete package, because it’s very drought resistant, uses little fertilizer and needs only one cut a year. The field research by Smith in Kentucky, and others in the Great Plains, is an attempt to build on decades of studies that had shown initial promise with switchgrass. The plant has been increasingly touted as one of the ways to wean the country from foreign oil by converting it to ethanol and a way to help sequester carbon in the ground." For Flavell's story and his nice slideshow, click here. At least implicitly, a reported 32 ministers across the country backed Republican Sen. John McCain of Arizona for president yesterday, "hoping to generate a legal battle that will prompt federal courts to throw out a 54-year-old ban on political endorsements by tax-exempt houses of worship," reports Peter Slevin of the Midwest Bureau of The Washington Post. "The ministers contend they have a constitutional right to advise their worshipers how to vote." "Their opponents contend that the tax laws are essential to protect the separation of church and state," Slevin writes. "They say political speech should not be supported by a tax break for the churches or the worshipers who are contributing to a political cause." The 1954 law says that to remain exempt from federal income taxes, non-profit organizations may not "participate in, or intervene in . . . any political campaign on behalf of any candidate for public office." For our Saturday posting on this, click here. UPDATE, Sept. 30: Conservative syndicated columnist Cal Thomas responded to the effort, saying that politicized sermons are a poor substitute for what worship is intended to be. He writes, "Churches and ministers would do better to keep their attention focused on things above, rather than the things below, because politics can be the ultimate temptation and pollute a far superior and life-changing message." "Democrats may have finally found a wedge issue to pry away some rural voters from the Republican Party: ethanol," writes Philip Brasher of The Des Moines Register, citing veteran legislator, farmer and John McCain supporter Ralph Klemme of strongly Republican northwest Iowa. "Klemme believes McCain may well lose the state this time because of his opposition to federal ethanol policy." President Bush lost Iowa in 2000 but won it in 2004. In Pennsylvania, a state with many more electoral votes, John Guerriero of the Erie Times-News quotes area political scientists as saying that Barack Obama could do better than recent Democratic nominees with rural voters because of economic turmoil. "Rural areas tend to lean Republican and conservative," he writes, "But with shake-ups on Wall Street and a proposed $700 billion government bailout, this is no ordinary election year." On the ethanol front, "Obama is trying to take advantage with some aggressive outreach recently to farm groups," Brasher reports. "Six former presidents of the National Corn Growers Association, including five who served from 2001 to 2006, recently signed a letter endorsing Obama. The association itself hasn't endorsed either candidate." One of the signers is from Ohio, "a must-win state for McCain." (Read more) Brasher's story, apparently written Friday, doesn't note that in Friday night's debate McCain voluntarily reiterated his opposition to the federal tax credit for ethanol. For our debate story, click here.